In Aruba you can bask on the beach with your friend or head out to enjoy world famous high winds of the Caribbean Sea. There is no more perfect place to windsurf or to kitesurf. The best gear on the planet and a wide variety of windsurfing and kitesurfing accommodations await your arrival. World famous instructors and wind- en kitesurfing specialty shops are at your beck and call. If you are a kite- windsurfer, Aruba is the perfect place to be. Every year in June/July, Aruba hosts the Hi-Winds Amateur World Challenge windsurfing and kitesurfing tournament. This five-day competition attracts the most competitive professional windsurfers, kitesurfers and hundreds of amateurs to the island of Aruba and is sanctioned by the PBA (Professional Board sailers Association). 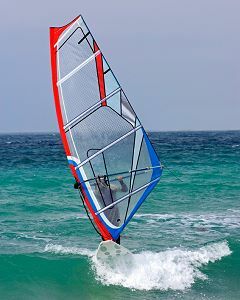 We have the largest and finest selection of windsurfing equipment in the Caribbean. We feature Exocet Boards in the SCross MC Line from 93 to 160 litres and Fanatic Boards in the Cross, X-Ray and Bee Lines ranging from 84 to 164 litres, for a total of 16 sizes of windsurfing boards. For beginners we have HiFly Revo's and Bic Melody's. All boards are equipped with Maui Fins. Aruwak offers a variety of lessons, come catch a wind in the Caribbean and learn with everyday kite boarders and IKO instructors. Also Aruwak is member of the National Surf Association (Arusurf) and offers a variety of surfing and body boarding lessons with local pros.